Where are we going for breakfast? Well, since you had your breakfast at 5:30 a.m., it’s my turn now and we are heading to Off The Waffle. It’s right here in downtown Eugene and is a favorite of many who enjoy traditional and creative waffles. I don’t know what a waffle is, but it sounds yummy and is that bacon I smell? It is bacon and you can get off the table now. 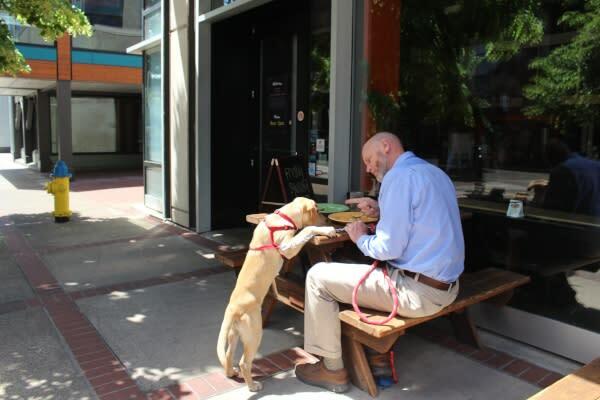 Off the Waffle welcomes dogs at their outside seating, so let’s show them how you can behave. My nap made me hungry. Is it time for lunch? I don’t think your nap made you hungry. I think you were born hungry. Yes, you can eat your lunch and then we’ll walk to Hot Mama&apos;s Wings and I’ll grab a bite to eat. What’s a Hot Mama and why does she have wings? 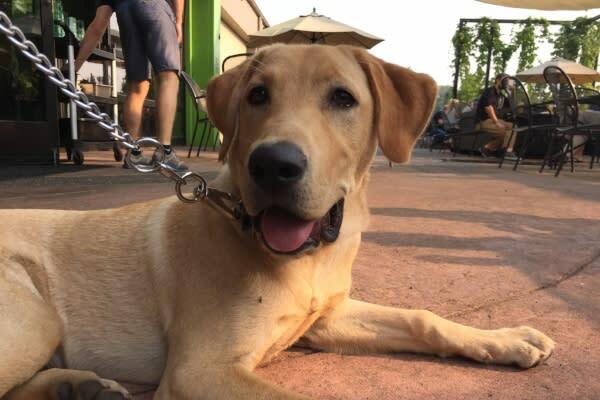 Hot Mama’s is a local restaurant that also welcomes dogs on their patio and they have two locations now - one in downtown and one at the Oakway Center. Today, we’ll visit the downtown location on 13th Avenue. I like walking through downtown. There are lots of people, sounds, smells and sights to check out. What’s that big picture on that building? 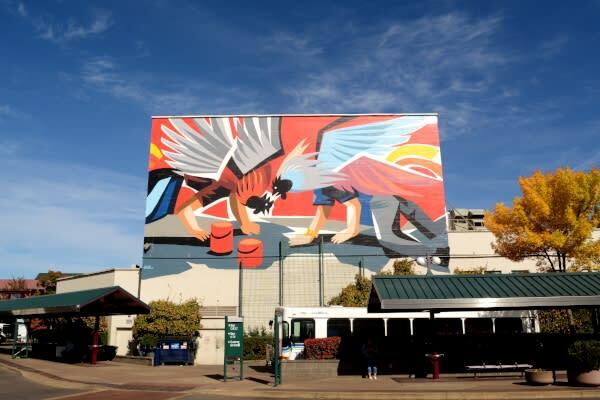 The picture over there by the Lane Transit District station is one of the 20x21 murals the City of Eugene has commissioned. There will be 20 murals completed by the time Oregon21, the World Track and Field Championships, comes to Eugene in 2021. What’s track and field? Can we see more murals? You ask a lot of questions Baxter. Track and field is a sport and some call Eugene TrackTown USA, but let’s focus on where we’re going. Lunch - my lunch. Hot Mama’s smells good and those wings look tasty. Don’t be eyeing my wings Baxter. They are tasty and there are many wings and sauce options to choose from, but there’s also a good selection of other food items. I also appreciate the variety of craft beer selections because many are local breweries. Let’s head back to the office and finish our day before meeting mom for dinner. Dinner - Is it time to eat? I’m hungry. No Baxter, it’s not time for dinner. You’ll be the first to know when it is. Tonight, we’ll see how you like Hop Valley Brewing. I like to hop through the valley! (Later) Here we are at Hop Valley Brewing on 1st Avenue in Eugene and there will be no hopping from you. 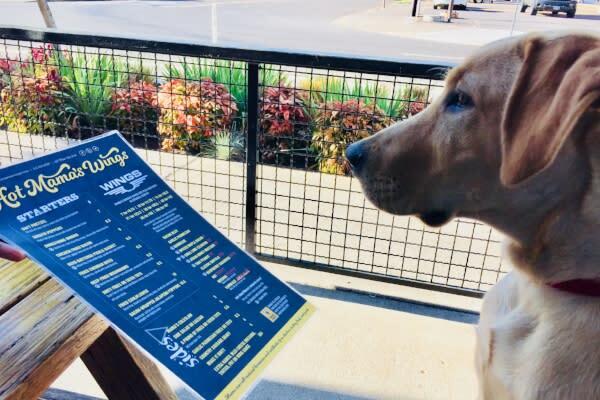 Hop Valley is a fun stop for a bite to eat and cold craft beer. That would be for your mom and I, not you. Ah, you guys are no fun. It is fun place and they even have water bowls by the tables. Hey look, there’s Pug and over there is a Boxer. Hey guys, are you having fun? They do welcome dogs here at Hop Valley and dog owners do a good job too. 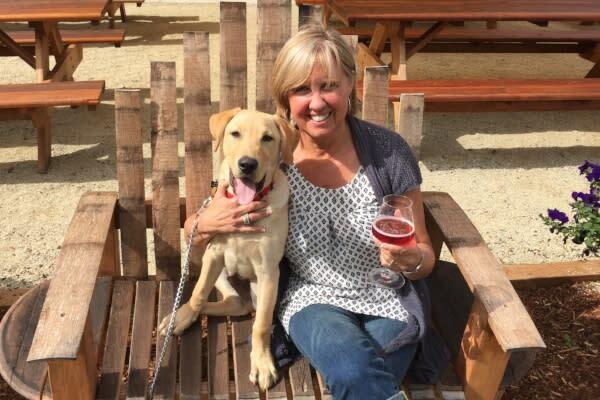 The staff is very dog-friendly and they even have their own brewery dog that looks just like you! That was fun, so what’s next? I’m getting hungry watching you two eat. You’re hungry – what a surprise! Well, if you are a good boy we’ll walk over to Sweet Life Patisserie for dessert. The Whiteaker Neighborhood has many breweries, wine tasting spots, restaurants and there even a couple of amazing bakeries to experience. I could help you with dessert. They have large portions and you shouldn’t eat a whole one. Thanks for looking out for my waistline. The desserts are good size and taste heavenly, which is why mom and I plan to share. Ah, you guys are no fun. You’re getting pretty good at that line. Are there more places I can go with you and mom to eat? There are many other locations where you can join us and some even let you go inside. 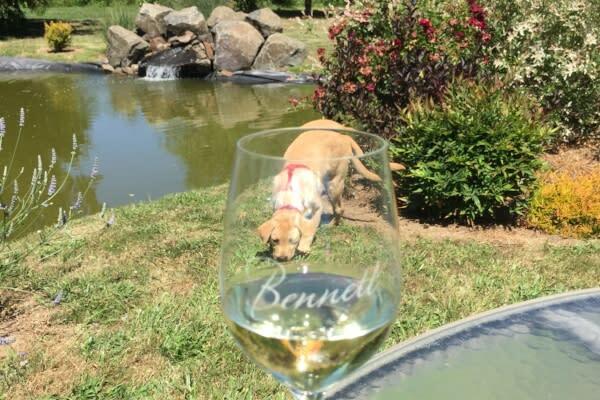 Do you remember stopping at Bennett Vineyards & Wine Company when we came back from Florence? I do, I do! There was a birthday party going on and lots of people wanted to pet me. And they had that pond with a waterfall where you sat and drank a glass of wine. You have a good memory Baxter, but it might be difficult to remember all the great places you can come to with us. You probably forgot already the fun time we had at Alesong Brewing. 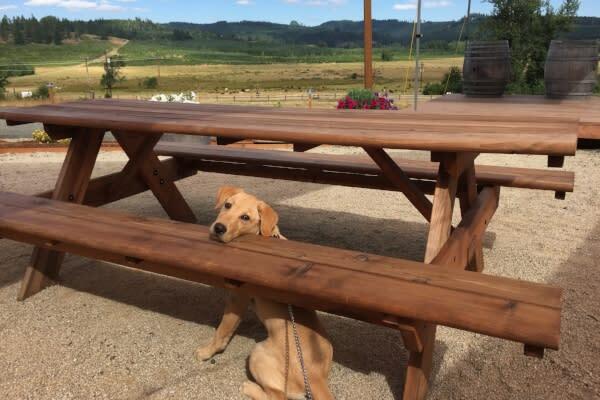 Fortunately, Travel Lane County lists dog-friendly information for its member businesses and this makes it easy for dog owners to check a location before bringing their adventure dogs with them. It’s super fun to visit all these great restaurants, breweries, wineries and other businesses. I can’t wait for our next adventure.